Want to learn to rock? This is where you start! • Many Chuck Berry songs are based on "boogie rock" like this. • Picking is all down strokes. • You can add some "palm muting" to give it a heavier feel. • Try accentuating the down beats (1, 2, 3, 4). Lighten up on the up beats a bit (the "&'s"). • Standard blues uses the I, IV and V (1, 4, 5) chords. (Also called the "primary chords.") 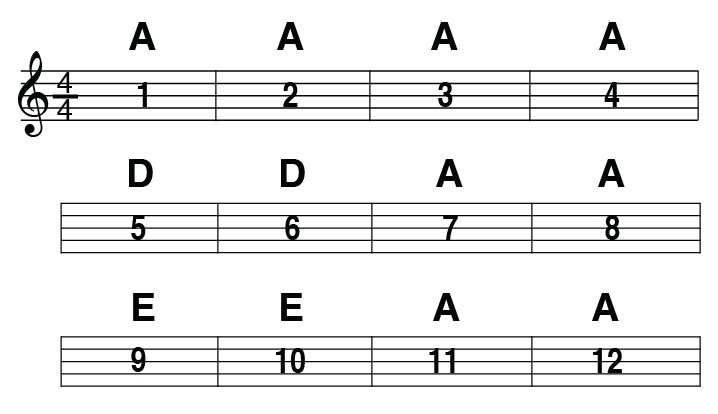 In the key of A, A is the 1 chord, D is the 4 chord and E is the 5 chord. • The main feature of rock is the steady, driving beat. So, work with a metronome or drum track to get it. Good luck!